Acclaimed author and army vet Martin Limon again hits the target with his 13th military murder mystery – THE LINE. As always, Limon’s books are richly enhanced by his five tours of duty in Korea starting in 1968. 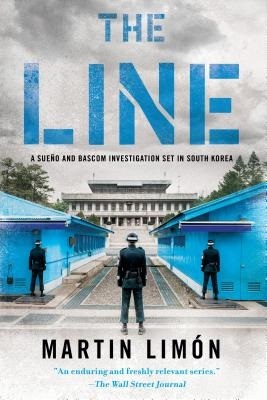 In The Line, his two irreverent 8th Army detectives George Sueño and Ernie Bascom investigate a murder of a South Korean soldier in the still explosive Demilitarized Military Zone (DMZ) line in Korea. The victim had been working closely with the U.S and is unfortunately found murdered a few feet north of "the line". George and Ernie are charged with dragging the body south into their jurisdiction. Their action is a violation of the fragile treaty that could lead to another war. To prevent a full-scale North Korean attack, George and Ernie have to solve the murder of the South Korean soldier. A US soldier is suspected and is quickly charged with the murder by higher authorities. Even though George and Ernie present hard evidence that proves he’s innocent they are shockingly taken off the case. The duo breaks all the rules because they believe the wrong man is behind bars. They face unrelenting conflict, including discrimination, three military bureaucracies with its ingrained politics, multiple murder suspects, and corruption on both sides of the war-zone. The verdict: Limon’s books have won the praise of vets, military writers and book reviewers, including the New York Times. The Line is available in books stores, online, Kindle, hardcover and Audible Audiobook, and Unabridged, as are the other twelve in the Sergeant George Sueño series: Jade Lady Burning, Slicky Boys, Buddha’s Money, The Door to Bitterness, The Wandering Ghost, GI Bones, Mr. Kill, The Joy Brigade, and Nightmare Range are available at https://sohopress.com/authors/martin-limon/, online and your local book store.